Beijing 2008 Olympic game is biggest sport event for most people who love sports, they want watch different games live but it does not mean every TV station play it live. Like me, I could not see most games live even opening ceremony. For Chinese people that is not problem, almost every Chinese channels are play it live, but for other countries, people just looking for watch live game online. I did that while opening ceremony. It is not easy to find a place that you can watch Beijing 2008 Olympic live game now, because some P2P internet TV clients removed Chinese sport channel cause copyright. Even Youtube blocked US user watch a Beijing 2008 channel, but some Asian countries users are still can watch it. How to watch Beijing 2008 channel? Valleywag posts a good way to hack Youtube. You can follow steps below to try if you can not see Beijing 2008 channel in your country. 1. Open YouTube.com in your browser. * On the Preferences pane that appears, click the Privacy Tab. * In the Cookies panel that appears, search for "youtube" in the search box. * Look for a cookie named "youtube.com GEO"
3. In the same browser window that has YouTube loaded, set your own GEO cookie by trying to open this URL in your browser. Do not break line. You should get a dropdown dialog box that says "The page at http://youtube.com says GEO=bb84fb3cd7df0 ..." This is not an error message, it's a notification that you've set the cookie successfully. 4. You should have a rigged GEO cookie for YouTube now. Try opening http://www.youtube.com/beijing2008. I suggest you use an Asian IP proxy like China or Thailand. First time I could not get right, so I try use this IP address: 219.93.175.67:8080, it works. 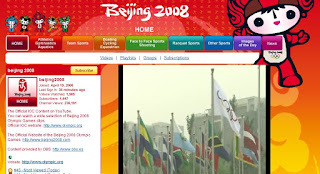 I use Downloadhelper to download a video from Beijing 2008 channel. If you don't get the splashy red Beijing 2008 page shown above, you may not have set the cookie correctly.